America has lost a true hero and patriot, John Baptist Kotmair, Jr., 83, of Westminster, Maryland, who passed from this world on December 13, 2017. He is survived by his wife, Nancy L. (Blunt) Kotmair, two daughters, two sons, 10 grandchildren, 17 great-grandchildren, and many American patriots who will always remember his unremitting efforts on their behalf. Together We Must Stand -- Or -- Separately You Will Be Stood On!!! Welcome to the "official" web page of the Save-A-Patriot Fellowship! We hope your visit will be useful and educational. Please note that no information herein should be construed to be legal advice, which can only be provided by a licensed attorney. We present only factual statements about the law. If you do find a statement that you believe to be in error please contact us! WE COULD HAVE REMOVED THIS COURT ORDER FROM THE SAVE-A-PATRIOT WEB SITE ON FEBRUARY 5, 2009, BUT DID NOT BECAUSE IT IS EVIDENCE THAT THE COURTS NOT ONLY ALLOW, BUT FOSTER MANY OF THE PROBLEMS WE ARE SUFFERING FROM TODAY IN THESE STATES UNITED. SUCH TOTAL DISREGARD FOR THE CONSTITUTION BY ELECTED OFFICIALS AND GOVERNMENT BUREAUCRATS COULD NOT FLOURISH WITHOUT THE COOPERATION OF THE COURTS. SO, ANYBODY TRYING TO SHED LIGHT ON THESE SEDITIOUS ACTS WILL LIKELY FACE THE SAME TYRANNICAL RESULTS. PLEASE READ THE COURT ORDER WITH CARE, THEN GO TO THE DOJ COMPLAINT PAGE WHERE YOU CAN ACCESS THE LINKS IN THE COURT DOCKET TO FOLLOW THE COURSE OF THIS CASE. THERE YOU WILL FIND THE EVIDENCE SHOWING THE GOVERNMENT'S TOTAL DISREGARD FOR THE LAW AND THE RULES OF THE COURT! SEPARATELY YOU WILL BE STOOD ON! Do Courts Have Law Making Powers? NOTE: DUE TO THE ABOVE COURT ORDER THE FOLLOWING BOOKLET IS NO LONGER AVAILABLE. To understand this action please read the court pleadings found in the "DOJ Complaint" section of this website. 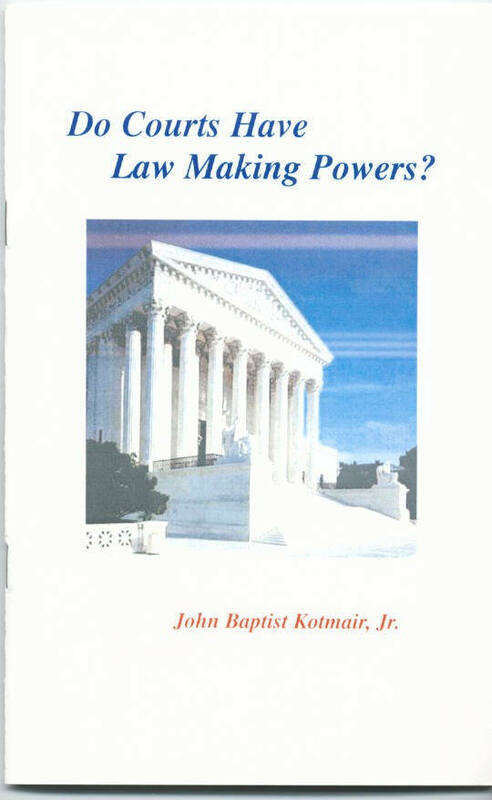 Prompted by the Supreme Court's ourtrageous action, ignoring the actual language of the 5th Amendment by declaring that private property may be seized by government and turned over to private developers for their personal gain, and the long history of abusive federal case law, the Save-A-Patriot Fellowship's Fiduciary, John Baptist Kotmair, Jr., has written this comprehensive documentary of the actual jurisdictional authority of the federal courts. This treatise is not only an enlightening tool for the Patriot, but is ideal for dissemination to those many uninformed Americans who are not only shocked by this attack on private property, but also concerned about the possibility of their own property being in jeopardy. NOTE: DUE TO THE ABOVE COURT ORDER THE FOLLOWING BOOK IS NO LONGER AVAILABLE FOR SALE. To understand this action please read the court pleadings found in the "DOJ Complaint" section of this website. "Deals with the whys and wherefores of the dwindling of American Individual Liberties. It sets straight the widespread misconceptions of what Freedom really is. It leads the reader through American history, revealing facts that are not taught in the established version of history to which our children are subjected. It exposes beyond a shadow of a doubt how Americans have been enslaved and don't even realize it. It names the individuals and presents irrefutable evidence of their treasonous acts. It reveals how America is 180 degrees from the purpose of its founding." "You have succinctly detailed the many past and continuing attempts being made by the socialists to return mankind to a state of servitude and ignorance and what steps we must take NOW to preserve our NATURAL right to be free and responsible citizens." "Written in John Kotmair's folksy style, 'Piercing the Illusion' was a joy to read. More importantly, it is packed with indispensable information that all Americans need to know. It serves well as another great reference tool for those in the Constitutionalist movement." from readers in praise of Piercing the Illusion! The Truth Behind the Income Tax 2-hour video that explores the fundamental issues revolving around the income tax, is now available online! Learn about the nature of income taxes & currency, and how government agency employees routinely misapply and subvert the law. Click here first for a short introduction to the full-length program. (Note: These links will take you to 3rd-party web pages. A broadband internet connection is required.) DUE TO THE ABOVE COURT ORDER THIS CONTENT IS UNAVAILABLE. To understand this action please read the court pleadings found in the "DOJ Complaint" section of this website. Liberty Tree The Liberty Tree, Save-A-Patriot's monthly news publication, is available here for viewing and download. Truth Attack To visit Truth Attack and read about the Tom Cryer victory, click here. DOJ complaint The Department of Justice has filed suit against the Save-A-Patriot Fellowship, obtaining an injunction. Details here. (Last update: 1/15/2008). Purpose What the Save-A-Patriot Fellowship is all about. Membership info How to join the Save-A-Patriot Fellowship. Basics The structure and application of Federal tax law. DUE TO THE ABOVE COURT ORDER THIS CONTENT IS UNAVAILABLE. To understand this action please read the court pleadings found in the "DOJ Complaint" section of this website. Instructional materials Educational videos, books, and materials available from SAPF. DUE TO THE ABOVE COURT ORDER THIS CONTENT IS UNAVAILABLE. To understand this action please read the court pleadings found in the "DOJ Complaint" section of this website. Articles from our newsletter Sample articles from the Fellowship's full-length newsletter, Reasonable Action. Complete sample issues now available for download! DUE TO THE ABOVE COURT ORDER THIS CONTENT IS UNAVAILABLE. To understand this action please read the court pleadings found in the "DOJ Complaint" section of this website. RA "What If" Special Edition Special Edition Reasonable Action Newsletter -- with plan to restore the Liberty Works radio network. DUE TO THE ABOVE COURT ORDER THIS CONTENT IS UNAVAILABLE. To understand this action please read the court pleadings found in the "DOJ Complaint" section of this website. Files Selected files from SAPF's FreedomNet BBS, available for downloading. Legal Research Links to resources for legal research available on the Internet. Caveat emptor Beware of hucksters, charlatans, and snake-oil peddlers posing as "patriots!" 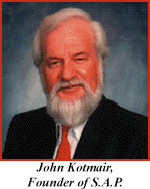 Kotmair v. Brown Save-A-Patriot fiduciary John Kotmair debates ex-IRS attorney on the air! us with any comments or questions!